The Minimum Effort Exercise Regimen | PrimeYours! In every form of media, in every aspect of our lives, we are bombarded with pressure to exercise more often, more efficiently, more strenuously. To look at media, and then actually look at the people who populate our culture, I would have to guess that these frantic messages of pinnacle fitness are reaching about 5%, and lost on the rest of us, other than as a constant nagging sense of a failure to perform. I personally, am tired of that little voice (and large magazine taglines) telling me that basically no matter what I do, I am neglecting some part of a “complete” health routine. If I were to follow all of the advice, doing 60 minutes of cardio (in my target heart zone—warm ups and cool downs don’t count) five times a week; doing 60 minutes of strength training three times a week; plus warm ups, cools downs and stretching for every muscle I engage, I’m not sure when I would have time to fit in my 6 “smaller” meals jam-packed with protein, only complex carbohydrates, and 8-10 servings of fruit and vegetables per day. When am I supposed to drink my 8-10 glasses of water and take my Omega-3 fatty acid supplements? Enough! It’s too much! And then the health nuts wonder why most of us just glance at the cover of any fitness magazine and quickly rush by to grab a DVD and a bag of chips to erase all memory of the slip. My problem is that I have always been of the opinion that there is no point in doing something halfway or incorrectly, because my time is too valuable to waste. Sure, I want to be healthy. Of course I want to have a healthy heart and great abs. But really, I have come to point where I just have to ask, what is the minimum I can do, so that I can have a strong heart, clear flowing blood, and minimal health- and love life-damaging fat (call it “bad” cholesterol, call it cellulite, call it “Bob”—I don’t care anymore)? I just want someone to tell me the basics, and an easy way to achieve them without dedicating my life, and those of three generations of my offspring, to the effort. There was no one to do this, so I decided to be the voice of reason and simplicity in this sea of fitness guru-ism. Needless to say, there’s a problem when I, the sedentary writer and couch fanatic, am that candidate. We have all heard the rhetoric of what is the “best” possible scenario for a healthy, fit lifestyle. If you have miraculously avoided this deluge of advice, you are either so out of shape that you haven’t been able to leave your bed for about 25 years, or else you live in the bush. If your savior has been the former, consult your doctor before you begin any exercise regimen. If you have a lot of extra weight and you find it difficult to get around, before you follow any of my advice, consult your doctor for a safe transition into introducing even the minimum in fitness into your life. But do it now, because I’m here to tell you, it’s not as hard as they all claim! In terms of your diet, yes, it better to eat small meals all day and follow that nutrition wheel you got in elementary school. Eat a balanced diet. If you want to lose weight, eat smaller portions, more fruits and vegetables, and no fast or fried foods. Drink light beer (it’s got about 1/3 of the calories of regular beer!) or wine. Eat fewer sweets. Or, only eat them once a week. It’ll take longer to lose weight, but you won’t be tempted to fall off of any wagons that set the standards so strictly that it makes you miserable to follow them. Life is too short and eating’s one of its great pleasures! 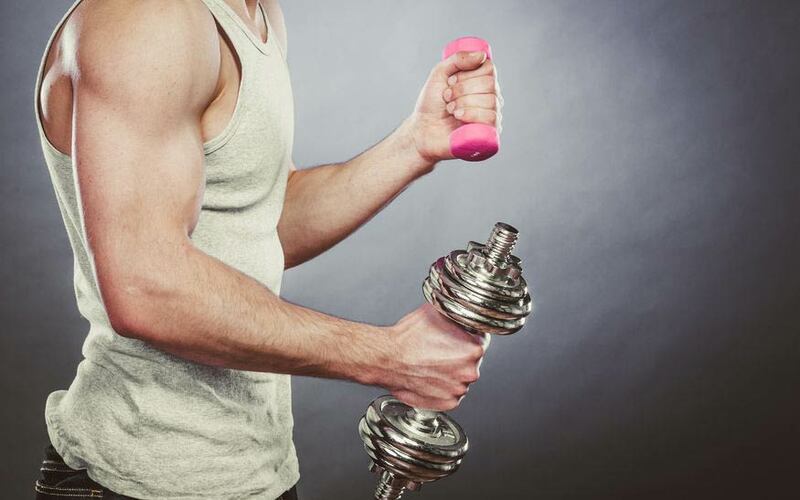 A fitness regimen that includes both cardio and strength training is best, that much we know. In terms of the “gym” workout, we know what that means. The minimum cardio to stay healthy is 20 minutes, 3 times a week. For strength training (lifting weights, using resistance machines), it’s twice a week. Cardio is important for your heart, circulatory system (preventing heart attacks and strokes), and to prevent certain diseases like high blood pressure and diabetes, which make your quality of life tank, and will eventually kill you. Strength training helps build bone density (to prevent breaks as you age and diseases like osteoperosis) and lean muscle mass, which is the only thing that raises your metabolic rate, meaning your body will work more efficiently in its daily processes, including burning fat. To achieve these goals, your two weight training sessions should include 8 exercises, working major muscle groups (legs, glutes, back, chest and arms). Do at least 1 set of 8 reps at a weight that results in you not being bale to lift a ninth rep.
You’re not going to go to the gym even 3 times a week if you are taking the time to read this article. If you had that kind of discipline, then an article about the least work for the minimum benefit while still being healthy wouldn’t interest you. You want something even simpler, right? Really, to be considered “physically active,” you need to do about 30 minutes of moderate activity most days of the week, according to the American College of Sports Medicine. And what do they consider “moderate activity”? If you work in an office building, walk up 5 flights of stairs, 5 times a day. The activity doesn’t have to be 30 continuous minutes. If you have a coffee break, instead of scarfing donuts, take a brisk 15 minute walk. There, half your workout is done. When you get home, mow the lawn, or shovel the walk. There’s the second half of your work out. Not only is that moderate exercise, you burned a minimum of 84 calories walking for only 15 minutes and another 251 mowing the lawn. If you like gardening, 30 minutes of it is considered moderate exercise, and burns 209 calories. Even stretching burns calories, and a limber body is one that doesn’t break hips or pull muscles. And you can do it in front of the television. If you can fit a 15 minute walk and one other activity into your day (stair climbing, swimming, running for the bus, frisbee, playing with your kids, raking leaves, washing and waxing your car), you are doing something. If you can add a two days of actually trying, like going to the gym, or getting involved in a team sport, you are way ahead of the game. Add 10 years onto your life. While you’re watching must-see-tv, skip rope every commercial. That’s 2 minute intervals of intense work. Skipping is great for your heart. Grab some barbells and lift weights while you watch the news. You don’t need to do the same thing every day, and in fact it is better for your body if you change up your activity every day (fancy health gurus call that “cross-training”). If you are very, very inactive when you start this lifestyle change, start small. Walk 15 minutes a day, once a day. Once you feel that’s not challenging anymore, walk longer, walk faster, or add a new activity. Feeling good about the little things you do everyday, instead of beating yourself up over the big workouts that you just keep not getting around to, is a good way to have a fitness plan that isn’t unrealistic and doesn’t set you up for failure. Failure that can only be soothed by nachos, with heaps of sour cream. And 8 pints of stout. The more you do, of course, the better you will feel and the healthier you will be, but don’t discount the things you are doing every day. Be proud of moving your body, and maybe just maybe it’ll feel good, and you’ll want to do it more. Extreme Measures: Are You A Candidate For Gastric Bypass Surgery? Beer Belly? It Could Be More Than Just Unsightly!